I know I’m a bad person, but this continues to amuse me greatly. A grand jury has indicted Montgomery County Judge Craig Doyal and two commissioners, charging them with violating Texas’ open meetings law last year while developing a bond package for new and improved roads. Traffic-weary voters in the rapidly growing county approved the $280 million financing proposal, but the indictments left Doyal and Commissioners Jim Clark and Charlie Riley to face criminal charges for their actions in getting it on the ballot. Grand jurors also charged Marc Davenport, an adviser who helped to broker a deal on the bond proposal. He is married to the county’s treasurer, Stephanne Davenport. Chris Downey, the special prosecutor who presented the case to the grand jury over six months, said that the misdemeanor charges are punishable by a fine up to $500, as many as six months in jail or both. Downey said that it’s too early to know whether the case will go to trial. “Like any criminal matter, whether or not a matter goes to trial is going to be a function of further discovery and negotiation,” he said. See here for the background. The charges are fairly small potatoes, and I’ll be very surprised if they result in any kind of guilty verdict. I just find it all hilarious. The next time anyone tries to tell you that the suburbs are so much better at running things than the big cities, point to this and remind them that we can generally get bond measures on the ballot without anyone getting indicted. Turns out that throwing more lanes at the Katy Freeway hasn’t helped all that much. Go read the rest for yourself. Speaking from my own experience, the Katy Freeway between 610 and downtown is clogged pretty much all the time, something that was almost never the case pre-widening. I’ve discussed this many times, how it’s not only the freeway itself but the cross streets at the freeway where people are getting on and off as well. I don’t know how much of this is people going far out on the freeway and how much is just because there’s more people in the Heights area and thanks to the bayou I-10 is the easiest way to get from Sawyer/Studemont to Durham/Shepherd, but I’m sure some of it is the “induced demand” that this story talks about. You can see it with your own eyes, not just inside the Loop but well beyond it. We got maybe a couple of years of smoother traffic, and now it’s a lot like it was before. All for $2.8 billion, with no obvious next step to take. Keep this in mind when you hear promises of this expansion proposal or that bringing relief to 610, 288, 45, wherever. The voters there are engaged in this issue, that much is for sure. Life is on hold in the parking lot that is Rayford Road, 4 miles of too many cars squeezing into too few lanes. Even when it isn’t so busy, which isn’t often, there is a chance a passing train can bring traffic to a halt. It is just the sort of bottleneck Montgomery County leaders intend to unplug with a $280 million bond measure to build new and wider roadways that voters will decide on Nov. 3. The measure would set aside the biggest chunk of money – $60 million – for improvements along Rayford Road, one of the county’s most congested streets. While the project could bring needed relief to traffic-weary drivers, the roadway represents only a small part of the rapidly growing county’s mobility problems. That’s because there are far more projects across the county than could be covered by a one-time burst of cash. A new study estimated road needs to be about $1.6 billion over the next quarter-century for just south county, roughly the area from the Harris County line to FM 1488 and Texas 242, including The Woodlands. If voters approve the borrowing, those funds could generate hundreds of millions more in state and federal aid for road projects, Sadler said. But voters have rejected the last two requests for new transportation money. Sadler, the former judge, said he expects the county to ask voters to approve more borrowing within next four or five years. While H-GAC’s study made recommendations with cost estimates, it’s not a comprehensive mobility plan, said Carlene Mullins, a transportation planner for the regional council. See here, here, and here for some background. I have no dog in this fight and don’t really care what happens with this referendum, I just continue to be amused by it all. It’s a lovely combination of parochial self-interest, severe dislike of spending money, and utter lack of planning, which is ironic given the super-master=planned status of The Woodlands, with a dash of back-room dealmaking thrown in for good measure. I’ve wondered before what Montgomery County will do if they continue being unable to pass these bonds, but it’s also worth wondering if they can solve their problems even with a compliant electorate. There’s an awful lot of demand on their roads, with a rapidly growing population and few if any other tricks in their bag beyond building more roads. What does Montgomery County look like in 20 or 30 years if can’t ever get anywhere in a timely fashion? I’m glad that’s not my problem. The Woodlands prides itself on being the best-planned community around, with tree-studded neighborhoods, miles of trails, sprawling parks and a town center with a distinctly urban feel. Across Montgomery County, however, some see The Woodlands as a snooty, well-off enclave that grouses about its tax dollars subsidizing services elsewhere. Unfair or not, those hard feelings are coming into view as the county nears a Nov. 3 vote on whether to invest in new and improved roadways. The $280 million bond measure is a slimmed-down version of one that failed four months ago amid heavy opposition in The Woodlands. After urging county leaders to try again on the coming ballot, the township’s governing board has come out against the revised bond measure, saying that the package is tainted because it was put together in negotiations outside public view. A special prosecutor is investigating whether the county’s dealings broke the state’s open meetings law. Even then, some local officials and residents are upset by The Woodlands’ hasty turnaround. The Woodlands board’s opposition to the measure before the investigation is complete has widened a divide between township and county leaders. Sadler, among others, was irked by the township’s sudden decision last year to pull out of a deal to help pay for a new customs facility at Montgomery County’s airport. Township leaders complained about a lack of responsiveness from county leaders. And in May, voters in The Woodlands rallied to defeat the initial road bond because it included a controversial extension of Woodlands Parkway west of the master-planned community, a project that critics said would worsen traffic woes. Forty percent of the voters in the countywide election came from its largest community, and they opposed it by a 9-1 margin. Penny Benbow, who resides in southeast Montgomery County, said voters outside The Woodlands listened to its concerns, and many rejected the bond measure, too. But the parkway extension isn’t part of the new bond package, and it’s time for the town to support it, she said. See here and here for the background. I know I’m a horrible person for saying this, but I find this whole saga to be hilarious. This sort of thing isn’t supposed to happen in the suburbs! You guys should be setting a good example for those benighted city residents! Stop fighting before you make Joel Kotkin cry! Bruce Tough, the board’s chairman, bristles at the suggestion that The Woodlands isn’t a good neighbor. He noted that the township has supported the Conroe Independent School District’s bond measures and pays “the lion’s share” of taxes in the county. Of course The Woodlands pays the lion’s share of the property taxes in the county. That would be because the Woodlands has the lion’s share of the property value in the county. If the Woodlands would like for its share of the property taxes to be lower, they’ll need for the rest of the county to be built up more. I don’t know what share of Harris County’s property taxes Houston pays, but I’ll bet it used to be more back when more of Harris County was uninhabited or undeveloped. The highest priority is Rayford Road, an artery that has become a backed-up pool of frustration for the unincorporated neighborhoods east of The Woodlands. Plans call for widening the road to as many as six lanes and building an overpass over railroad tracks. I predict that regardless of what happens with this particular bond issue, the problems won’t go away. In fact, I’d bet the projects that the bond would provide for give little more than temporary relief. This is partly because of the fast growth in Montgomery County – there’s only so much you can do when that many people are moving in – but it’s also partly by design. You pretty much have to drive everywhere in Montgomery County, and that’s not going to change. There are plenty of places you can live in Houston and do a minimal amount of driving. Until that becomes the case in Montgomery County, they’re going to have to keep paving to try to keep up. Good luck with that. Am I a bad person for being unreasonably amused by this? A special prosecutor has been assigned to determine whether behind-the-scenes negotiations could void a last-minute deal struck by Montgomery County commissioners to get a scaled-back $270 million road bond package on the upcoming November ballot. At question is whether some commissioners and a powerful tea party group violated the open meetings law. It would mark the third defeat of a road bond proposal in the past decade, with the last one coming four months ago when voters rejected a 20 percent larger bond proposal. A Texas Ranger has been ordered to gather emails, phone records and statements from those involved in the negotiations. Downey will then use the information to determine whether a quorum of elected officials intentionally held secret deliberations with the Texas Patriots PAC tea party that decided upon the bond proposal. County Judge Craig Doyal and Commissioner Charlie Riley have acknowledged meeting with the tea party group, but that doesn’t represent a quorum of the five-member court. However, if emails or phones were used to include other commissioners in the decision process, it could become a “walking quorum,” which violates the law. On Thursday night, The Woodlands Township Board voted unanimously to withdraw support given to the November bond package in light of the investigation. See here and here for some background. I haven’t followed the details of Montgomery County’s efforts to get another road bond on the ballot, and I don’t have anything constructive to say. I’m just laughing at the comedy of errors going on here. For a region that has so much growth and projected growth, they sure have a hard time governing themselves. You have to wonder if this inability to do anything will eventually hinder all that growth they’re supposed to have. Because of the fast-approaching deadline to get a bond proposal on the ballot, the organization said there was insufficient time for more input from residents. “Throughout this process, we thought of ourselves as representatives of all the conservative citizen groups. The framework ultimately agreed to was representative of what all the groups had been proposing since (the last bond defeat),” the statement said. I’m not the only one who thought of this, am I? I don’t know what this world is coming to when tea party groups start turning on each other. 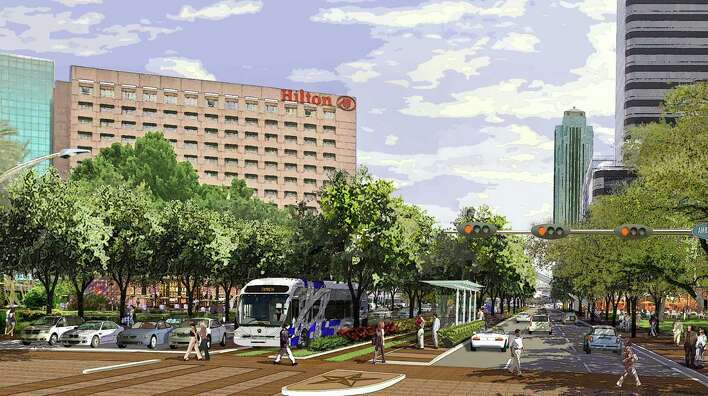 Public meetings meant to debut the massive plan to remake Houston’s downtown freeway system might be coming to an end, but it’s hardly the last chance residents will have to poke and prod the plans. Years of work remain on the $6 billion-plus project that shifts Interstate 45 to the east side of the central business district and sinks I-45 and U.S. 59 so the freeways act as less prominent barriers. By moving the freeway, Texas Department of Transportation officials are also eliminating the elevated portion of I-45 along Pierce. The Pierce Elevated would then be removed, or perhaps turned into a park or green space as some are suggesting. A fifth set of meetings — the first public meetings on I-45 were held in 2011, though some discussions date to 2003 — is likely next year, when officials will unveil their draft of the technical plan for the freeway. Despite a lot of attention on the major components of the plan, such as moving the freeway, some important details are tiny (in comparison) fixes to local intersections. 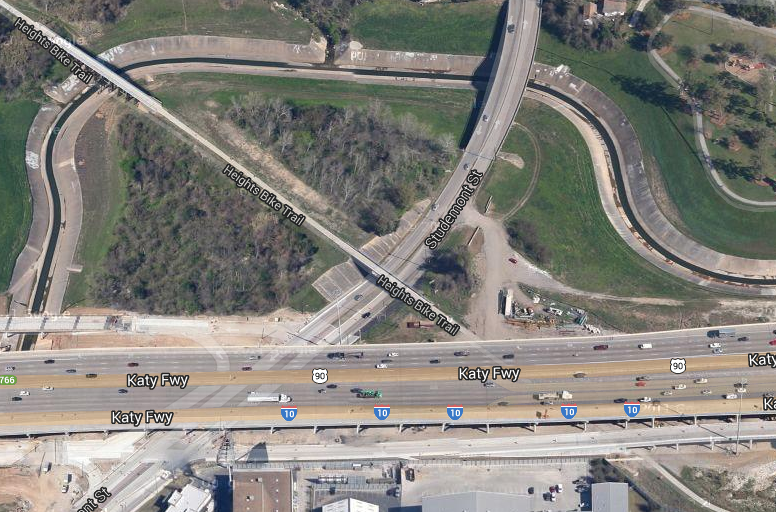 A sweeping ramp from Chartres Street that connects to I-10 and I-45 is an example, officials said. The ramp, which makes a high arc with tight curves, slows traffic and leads to a difficult merger with the freeway. Redesigning that ramp helps move traffic, which helps all lanes flow more effectively. There is a similar potential ripple effect from the new design that will ease congestion throughout the Houston region, said Quincy Allen, district engineer for TxDOT’s Houston office. After looking at some of the proposals, he said he is confident traffic on U.S. 59, Texas 288 and Interstate 10 will improve because of a better connection to I-45. “Every one of these legs is getting something fixed on it,” he said. Swamplot has a TxDOT-produced video that shows what the new highways will look like; a few stills plus typically snarky comments are here, and the full slidewhow from whence that came is here. It’s a little hard to wrap your mind around all of it; doing a before-and-after might have been more helpful. Purple City has a good explanation of why traffic through downtown is so bad now. I can only imagine what it will be like during the construction. Even with that, the downtown real estate set is all in. Be careful what you wish for. 1) Houston Avenue will no longer connect from White Oak to N. Main – Won’t that force a substantial increase of traffic thru Woodland Heights for no reason? 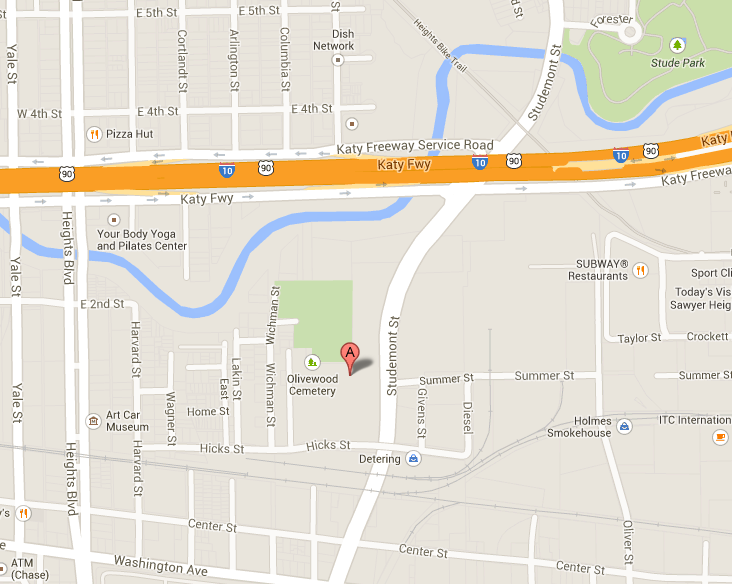 2) Why does TxDOT remove the current highway entrance from Houston Ave and reroute it to North Street? That will destroy acres of trees and route more traffic thru Germantown Historic District for no reason. 3) TxDOT says that the “Main Lanes will be elevated” between 610 and Cavalcade – What does elevated mean? The Main Lanes are currently at ground level. Public comments will be accepted through May 31. Go to http://www.ih45northandmore.com/ and tell them what you think. It’s a common dilemma for Houston motorists. Congestion in Houston increased sharply from 2013 to 2014, according to a report released Tuesday by TomTom, developer of the mapping and traffic data fed to phones and other GPS devices. Analysts said trips in the region on average last year took 25 percent longer than they would have in free-flowing conditions, compared with 21 percent longer in 2013. This means that a hypothetical 30-minute, congestion-free trip, on average, takes about 52 minutes at peak commuting times. For an entire year, it means drivers waste 85 hours – more than 3.5 days – plodding along the highways and streets of Houston. It’s the first increase in TomTom’s traffic index for Houston in four years after three consecutive years of slight declines. 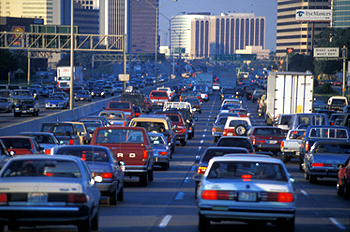 Growing cities with robust economies tend to experience the biggest increases in traffic. Oil price dips notwithstanding, Houston certainly fits the bill, said Tony Voigt, the program manager for the Texas A&M Transportation Institute’s Houston office. Voigt said local analysis supports the conclusion in the TomTom report: More local streets and highways are more congested for more hours of the day. Even weekend trips to some spots – notably retail corridors – can be increasingly time-consuming. “This is a result of more people living here as compared to two or three years ago and our economy being very active and healthy,” Voigt said. The rest of the story goes on in that vein, and you can read it for yourself if you’re interested. What I’m interested in is this: The I-10 expansion project was completed in October, 2007. Certainly at the time, traffic flowed much more smoothly than it had before the project began in 2003, but just as certainly, it’s slower now. That’s especially the case for I-10 between downtown and the West Loop, since all those new drivers on the widened freeway still have to go somewhere. What I’d like to know is this: How do the average speeds on I-10 now for various stretches compare to what they were in 2003? I would expect that overall it’s still better, but is it $2.8 billion worth of better? And at what point are we going to start hearing a call to Do Something about traffic on I-10 being too damn much again? Like I said, I’m just curious. I’m sure TxDOT and/or TransStar has that data, but I’m not curious enough yet to pursue getting it and doing something with it. Am I the only one who wonders about this? For more on the report in the story, see Hair Balls and Dallas Transportation. All that growth has its downsides. The Houston-Galveston Area Council, along with local entities including The Woodlands, Montgomery County, the City of Oak Ridge North and the Texas Department of Transportation, are working on a South Montgomery Mobility Study that they hope will ultimately ease the woes of commuters. Officials say they realize there are no easy answers. But they say the blueprint will help guide transportation planning for years to come. Preliminary findings reveal that most of the main arterials in and surrounding The Woodlands, such as Woodlands Parkway, Gosling Road and Kuykendahl Road, are either at or over capacity. Congestion will only worsen as new residential communities and companies break ground in the coming years, according to early data and area council officials. Township board members said that some residents believe the township and other regional leaders are not working quickly enough, as growth stresses the local infrastructure. For many, completion of the study can’t come soon enough. “I have residents calling and saying, ‘Why can’t you do something? '” said Jeff Long, a member of The Woodlands Township board. He said the No. 1 concern he hears from residents is that they’re spending too much time in traffic. My advice is to invent a time machine, travel back to 1975 or so, and try to convince George Mitchell to do a traditional grid design for the streets instead of the mishmash of self-contained cul-de-sacs that exists now. I mean, it’s not like we haven’t known for some years now that this funnel everything to a single main road approach doesn’t work so well. Doing a grid would also allow for the creation of a public transportation network, and would also allow people to, you know, walk or bike to certain destinations instead of having to drive everywhere. It’s so crazy it just might work! While I maintain that the time machine approach would ultimately be cheaper and less disruptive to The Woodlands and other parts of southern Montgomery County and far north Harris County – I wonder if all those soon-to-be-relocated ExxonMobil employees are aware of this? – I daresay that’s not likely to be the way the folks that are charged with fixing this will go. What the next best alternative is, I have no idea. Whatever solutions they do come up with, I’ll bet they can’t afford them with their current level of taxation. Good luck, y’all. You’re going to need it. Nearly six months since trains began rumbling north of the central business district along Main and Fulton on the north side, residents and community leaders said the train is becoming a valued part of the neighborhood and a critical link for many transit travelers, even as it contributes to record-setting use of the rail line. After adding 5.3 miles of track from the University of Houston Downtown to Northline Commons outside Loop 610, the Red Line posted more trips for the first three months of 2014 than in any three-month period in the light rail system’s history. Based on ridership data compiled by the American Public Transit Association, more than 3.5 million trips were logged on the Red Line from January to March. What’s harder to calculate is how many of those rides were skimmed from the bus system. Route 15, which largely followed Fulton, was discontinued when the northern extension opened. Two lines that run a similar north-south path along nearby streets, Route 78 and Route 24, have experienced slight decreases in ridership. When the bus and rail routes are all compared, overall ridership on the Red Line, Route 24 and Route 78 was 4.7 percent higher for the first four months of 2014 than the same lines – and the discontinued Route 15 – during January through April of 2013. We knew that the first month’s ridership numbers were strong, so this is just a continuation of that. It should’t be a surprise – the Main Street Line has far exceeded its initial ridership projections from the beginning, and the North Line is an extension of the Main Street Line. It would be weird if its ridership numbers weren’t strong. But since one of the criticisms that the anti-rail crowd has long made – and continues to make, despite all the evidence to the contrary – is that nobody really uses the train, it’s important to highlight the fact that they are still wrong. Skeptics point to the $756 million cost ­­- $142.6 million per mile ­­- for the north line and suggest the money could have been better spent adding bus service. Federal funds awarded solely to rail projects covered $450 million of the cost. I was going to start this sentence by saying “I’d take our local rail skeptics more seriously if…” but the honest truth is that I don’t take them seriously because they’ve never given any reason to be taken seriously. They’ve never been about anything more than hocking spitballs at light rail. Oh sure, they’d occasionally intone somberly about how Metro really should pay more attention to its bus service. And that’s the tell, because as we know Metro recently completed a vast, overarching redesign of its bus network that will simplify routes, provide a lot more service, and have a goal of increasing ridership up to 20%, all without adding any cost to the system, yet the silence from the anti-rail peanut gallery has been deafening. Bill King still hasn’t written a single word about this, for crying out loud. So yeah, I don’t see any point in mistaking them for people with a constructive role to play. As for the cost, I mean, look, we’ve spent countless billions on widening highways, and we still have terrible traffic. All that widening ultimately does is shift the mess to other parts of the highway and the surface streets. We’re already at a point where simply adding more lanes to existing highways isn’t practical or in some cases even possible, so the solutions being put forth are esoteric, to say the least. Light rail is scalable and sustainable in a way that highway construction just isn’t, and it has other benefits besides. As I’ve argued before, there are no single solutions. There’s a suite of ways to improve access and mobility, and light rail is a key part of that. It’s definitely doing its part, and we should be glad for that. The Highwayman has more. So what is the capacity of the Katy Freeway these days? This story was about the increase in the toll on the managed lanes of the Katy Freeway, but there was a tidbit at the end that caught my eye. When officials started widening the freeway in 2003, at an eventual cost of $2.8 billion, their goal was to ease congestion in one of the area’s most clogged corridors. The freeway then had 11 lanes and was carrying more than 2.5 times its capacity of 79,000 vehicles per day. Now with 20 lanes in some spots to flow traffic – including the managed lanes and frontage roads – the freeway can handle more vehicles, but demand is increasing as well. In 2003, the average daily traffic count along I-10 at Wirt Road was 202,500, according to the Texas Department of Transportation. By 2011, the last year for which verified counts are available, the average traffic at Wirt was 274,600, a 35 percent increase. Yet the freeway still isn’t as congested as it was prior to the widening, said Alan Clark, manager of transportation air quality programs for the Houston-Galveston Area Council. So the pre-expansion capacity of the Katy Freeway was 79,000 vehicles per day, and they basically doubled the number of lanes, what is the capacity today? I don’t know if you’d simply double that 79,000 per day figure, or if the math is more complicated than that. It sure would have had to go up quite a bit – like, almost four times as much – to stay ahead of that 274,000 vehicles per day average we’re seeing now. To say the least, I have my doubts about that. I sent an email to Chron reporter Dug Begley to ask about this, but he never replied. My point here is that way back when this expansion was still a twinkle in John Culberson’s eye, critics of the expansion were predicting that traffic levels would quickly rise to fill the extra capacity that was being built. Sure looks to me like they were right. 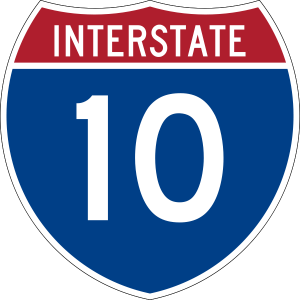 No question, I-10 needed to be expanded, but where do we go from here? The design of the widened I-10 left no room for rail, further widening seems unlikely, and going up with a second deck or down with a tunnel would seem to be prohibitively expensive. Denser development with more and better transit is starting to look pretty good, isn’t it? Maybe we’ll have better luck with that next time. Yes, but why is traffic so bad at these places? Two things that aren’t mentioned in this story but need to be. [David] Schrank, a co-author of the report, said changes to methodology led to some spikes in average congestion along certain routes. Areas with major freeway interchanges saw average congestion estimates increase, giving planners a fuller view of the gridlock afflicting most areas of the state. Houston’s two worst freeway segments are along U.S. 59. The stretch from Interstate 10 to Texas 288 ranks second-worst in the state, with an average of 743,006 hours of delay annually, per mile. The freeway from 288 to Loop 610 West ranks third-worst, with 730,655 hours of annual delay, per mile. Only a segment of Interstate 35 in downtown Austin fares worse. “When you have a really, really bad quarter-mile or half-mile, it makes the whole area much worse,” he said. “You clearly have as much traffic going north and eastbound on 59 in the afternoon as you do in the morning,” Emmett said, saying any remedy needs to consider the traffic flow. That same problem causes backups on 288 northbound as well. Interchanges are a big part of the problem, no doubt. I-10 eastbound at I-45 South, where the one exit lane can be backed up to the Studemont exit or farther, is a classic example of this. But as I’ve noted before, the main issue with 59 northbound as you approach 288/45 is that it narrows down from five lanes to three at the downtown spur, then down to two lanes at the 288/45 turnoff. The volume of traffic that wants to continue north on 59 past these points is just too much for the available capacity. I hesitate to make absolute statements, but I don’t see how this can ever be resolved by adding more lane capacity, because there just isn’t the room for it. It’s a problem that isn’t going to go away. The other point is that one big reason why there’s so much demand for that limited amount of lane space is because we’ve spent the past 20 years building much more lane capacity from Loop 610 and/or Beltway 8 outward on all the major freeways. A lot more people now live out where those expanded freeways take them, and they’re all trying to fit into those squeezed spaces on their way to and from their homes. That’s not the only reason for this – as noted, the traffic problem exists well outside the rush hours these days – but the same principle is in play. There’s much more demand for these freeways outside these urban core congestion zones, and that demand puts extra pressure on the places that are least able to handle it. I’ve said this before and I’ll say it again: We’ve pretty much maxed out our ability to deal with traffic by throwing more lanes at it. Unless we start double-decking or building tunnels, what we’ve got most places is what we’re going to have. One thing we can do but have not done is provide viable alternatives to taking the freeways for the people who are mostly moving about in town. Taking the people who are making short trips out of the equation and you can free up some space for the long haul drivers who have no other alternative. It’s the same argument I make about urban core restaurants providing bike parking to help keep spaces available for the customers who have to drive to get there. That’s going to require a much bigger commitment to and investment in public transportation, and so far there isn’t much evidence that’s going to happen. If they really thought about it, the people who have to navigate these traffic disasters every day ought to be the biggest supporter of expanded mass transit precisely because it will help get the people who would have options other than driving off the road. Someday I hope that argument sinks in. I still have a bad feeling about this. In a first step toward providing relief, transportation officials will spend the year winnowing six possible locations for reversible toll lanes that would provide a direct connection between the sprawling medical campus and Texas 288. They hope to start construction in 2014. 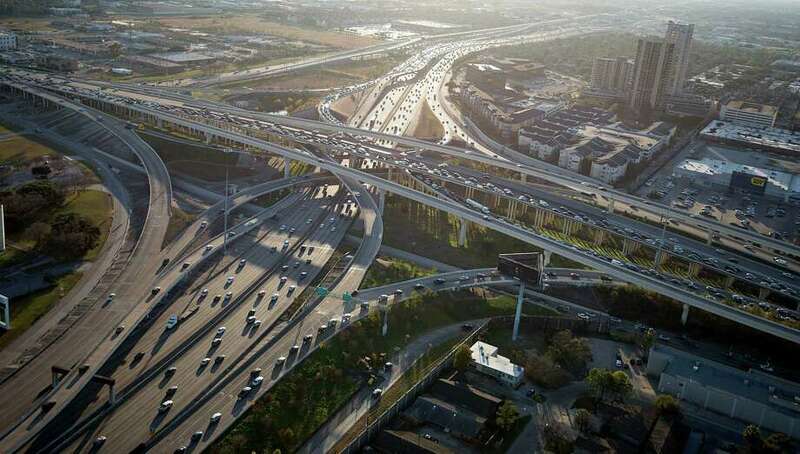 Texas 288 between U.S. 59 and Interstate 610 is the 25th-most-congested freeway in Texas, according to a Texas Department of Transportation analysis. And not all the blame can be assigned to Texans games at nearby Reliant Stadium or to tourists looking for the Astrodome. “A significant number of motorists traveling along 288 between downtown and Brazoria County are traveling to the Medical Center,” said TxDOT spokeswoman Raquelle Lewis. The center includes more than four dozen medical institutions, employs about 100,000 people and has nearly 7,000 hospital beds. Reversible ramps would allow traffic to flow faster in and out of the area during peak commuting times, Lewis said. The ramps would complement a larger project to add toll lanes on Texas 288 from U.S. 59 to Brazoria County. Residents have until Feb. 22 to comment on the project to add a ramp connecting the freeway and the Medical Center south or east of Hermann Park. Plans call for a roughly $12 million flyover linking Texas 288 and a street around the center. In addition to the freeway improvements, Houston plans to add one lane in each direction to Almeda Road between South MacGregor Way and Old Spanish Trail. Transit and pedestrian improvements also are planned for Main Street. I’ve expressed my concerns before, and I don’t really have much to add to that. At best, I think this will mostly move some congestion from the highway to the connectors and the surface roads. It still won’t do anything about the backup at 59, which is what causes most of the delay on 288 as you head north past 610. Ultimately, the only solution to to the problem of too many cars trying to park in a limited area is to reduce the number of cars trying to park, which is to say to provide viable non-car alternatives. I have no idea what, if anything, is currently on the drawing board for that. UPDATE: The Chron editorializes on the subject. No doubt that traffic on the Katy Freeway moves a lot more smoothly now than it used to. But there’s a lot more to the question of whether the $2.8 billion that was spent to widen it was a good investment or not. 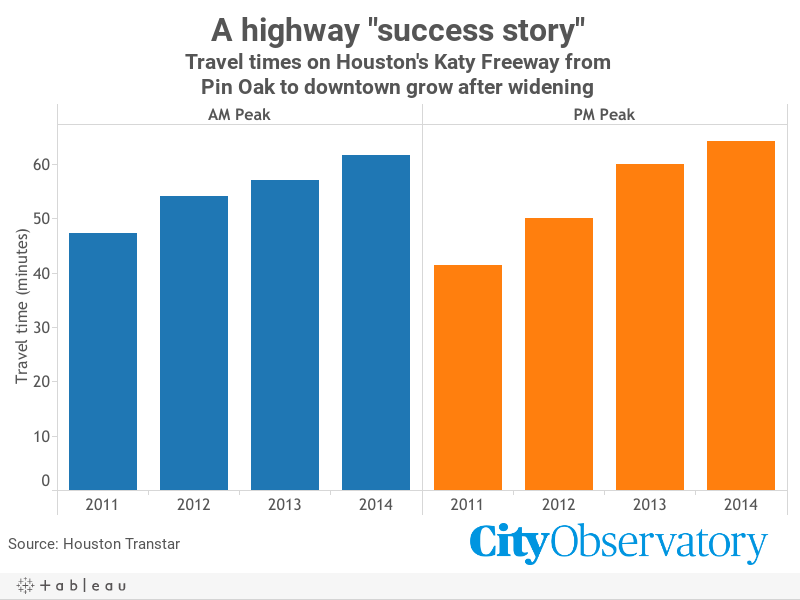 Four years after the project was completed, a comparative analysis of drive-time data for a three-year period before and after the expansion shows that at both peak and non-peak periods of the day, it takes less time to traverse the Katy Freeway than it used to. It’s a matter of mere minutes – the morning commute from Barker-Cypress to Taylor, for instance, a distance of 19 miles, now takes, on average, 27 minutes. It used to take about 33 minutes. But added together, the users of the Katy Freeway are spending a lot less time in their cars. The evening commute on that stretch now takes an average of 28 minutes as opposed to 38 minutes and 30 seconds. Data show there is still congestion at peak periods, particularly the evening commute out of the city, but what was once a daylong traffic jam is now for the most part smooth sailing. I’ll stipulate to that. I remember driving back in to Houston on Sundays from Austin or San Antonio before the expansion and hitting traffic from Highway 6 on in. That doesn’t happen any more unless there’s been a wreck. The average commute time differences seem rather minimal to me, but I suppose the main thing is that it’s much less likely to take an hour to get where you’re going than it used to. For sure, there’s real value to that. But no one ever argued that a widened I-10 would shave a few minutes off commute times. The argument was that there were better design options for this project. The Katy Corridor Coalition’s website is long defunct, but this Chron story from 2003 covers the gist of their case. 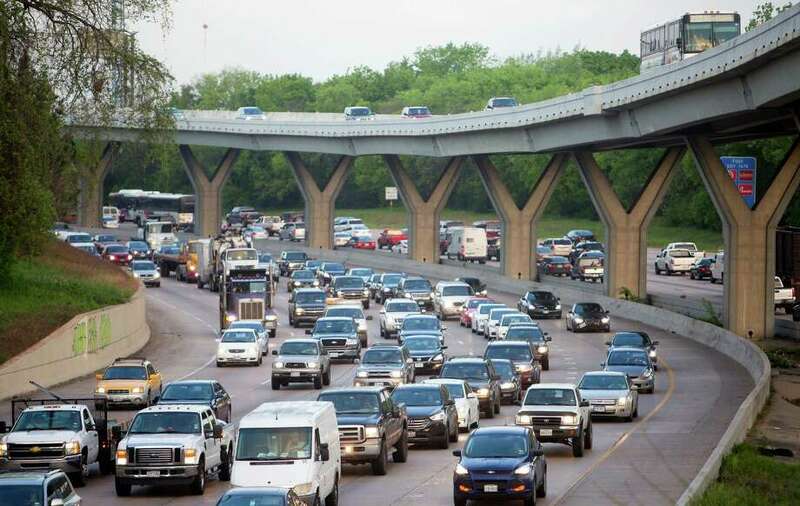 The Katy Corridor Coalition – a group of west Houston residents fighting the state’s plans to widen the Katy Freeway – will offer a plan today that calls for sinking several miles of the interstate and planting thousands of trees to filter out air pollution. The coalition, which has filed a lawsuit to stall the massive freeway expansion, said its plan is a more intelligent way to combat air pollution, traffic noise and congestion. Practically and politically, the new plan might have little chance of becoming reality. But it does seem to echo successful efforts by affluent residents of the Museum District in the mid-1990s to convince state highway planners to sink part of the Southwest Freeway. 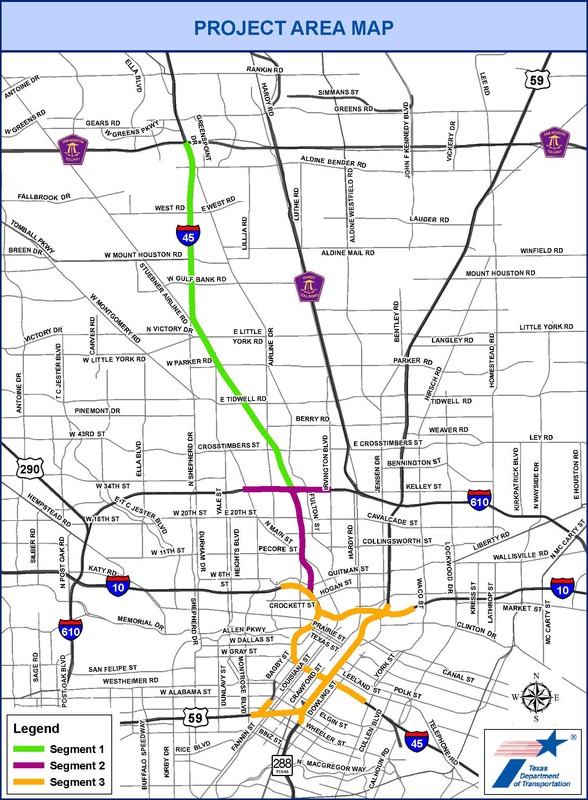 Jim Blackburn, the coalition’s attorney, said Wednesday that the proposal is a reasonable alternative to current plans to expand the freeway from 11 lanes to 18, including toll lanes down the middle of the interstate. Although coalition plans call for sinking the freeway about 20 feet below ground level from the West Loop to Beltway 8, Blackburn estimated it will only add about $100 million to the $1.1 billion project. The work, he added, could still be done within the six-year timetable officials are already using. 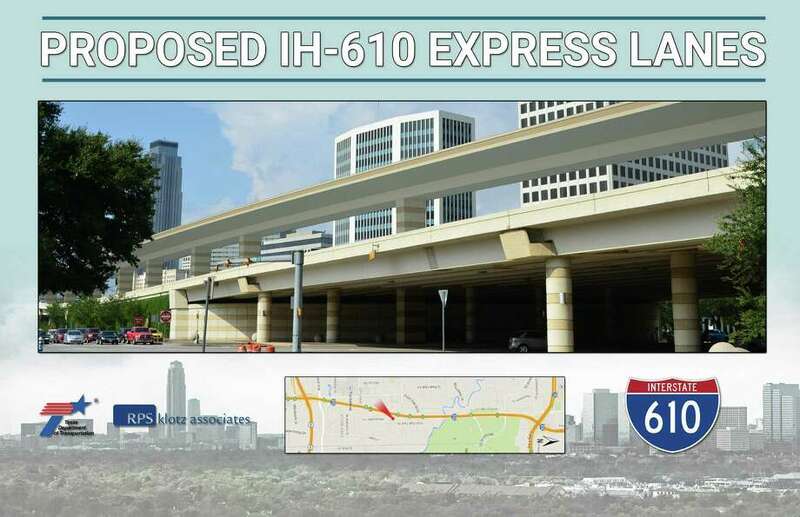 And though it would mean massive redesign, the coalition’s proposal leaves room for toll lanes the Harris County Toll Road Authority wants to build and provides dedicated space for a future commuter rail line, Blackburn said. Boy, remember when this project was only supposed to cost $1.1 billion? Those were the days, I tell you. The KCC’s design plan – which, presumably, would have wound up adding more than $100 million to the final cost, given how much more expensive everything else turned out to be – was generally well-received by those whose interests were broader than simply adding more lanes as fast as possible, but in the end none of what they pushed for was used. We can’t know what things would look like now if the KCC had been taken more seriously by TxDOT, HCTRA, and John Culberson, but it is worth asking if the money we spent was spent as wisely as it could have been. Is a six to ten minute reduction in peak travel time about what we expected? How long do we expect this effect to last – I mean, you have to think that when that new Grand Parkway segment is built it’s going to increase volume on I-10 – and what if anything is there to be done about it when traffic starts backing up again? Sure might have been nice to have that commuter rail option that was rejected. Do we have any idea what the effect of the expansion have been on air quality and flood control, which were two of the things that the KCC plan tried to address? Travel time is just one dimension of this project. It’s good that it’s worked out well so far, but that should be where the conversation begins, not where it ends. There are finally some updates regarding I-45! As you may recall, back in mid-November 2011, TxDOT held 2 public meetings to get the public’s input on their thoughts on what should be done regarding the expansion of I-45. Comments were encouraged via email, website, comment forms, etc. TxDOT was supposed to publish those findings within 2 months after the meetings. Well 2 months came & went, 6 months and now – 10+ months after the November meetings, the results have been posted! You can find them by going to TxDOT’s website for this project at www.ih45northandmore.com. Left column at ‘NHHIP Scoping Meeting Documents’. If you made comments – make sure they are there & accurate. Many of the comments make very interesting reading! On Sunday, 9/2/12, the Chronicle reported that I-45 between Loop 610 & Beltway 8 had the 3rd worst congestion in Texas! I-45 between I-10 heading North to 610 was the 10th most congested. I-45 heading South from I-10 to 610 was ranked #13. A couple days later, the Chronicle reports that TxDOT is considering the concept of a downtown “roundabout” to help congestion. TxDOT will be holding their 2nd round of public meetings to discuss I-45 soon, probably sometime this fall. No specific date has been announced yet. Please be sure that you are on the I-45 Coalition’s email list so that we can notify you when the meeting(s) will be held. If you are getting this email directly now, you are probably OK – but if you are going to change emails, perhaps adding a work email or home email or alternate email might be a good idea so that we can contact you. Please share this information with friends & neighbors – we need to be sure that TxDOT knows & understands the desires and concerns of folks that live & work in the areas that will be affected by TxDOT’s actions. As always, for updates, you can always check our I-45 Coalition Facebook page or our website at www.I-45Coalition.org. You can also sign up on our website (email info, volunteer info, contribute $, etc) or send me your email info directly to jim@I-45Coalition.org. If you would like to become more involved, you are welcome to attend our next (quarterly) meeting of the I-45 Coalition Steering Committee. Our next meeting will be held on October 22nd at 7 pm at the Lindale Park Clubhouse, 218 Joyce (off of Fulton in Lindale Park). Once activity on I-45 becomes more active, we will increase our meeting frequency. This has been & will continue to be a LONG, LONG project – but the MOST important time to be involved is NOW – while TxDOT is determining what the scope of the project will be, with a LOT of input from residents & taxpayers! Please stay involved if you value your homes, your neighborhood & your city! Two identical public scoping meetings will be held in the project area. An open house meeting format will allow the public to come and go at their convenience. Project team members will be available to discuss issues and answer questions regarding the proposed improvements and the EIS process. A short video regarding the project will be presented throughout the meeting. Maps of the study area and exhibits of the preliminary alternatives will be on display. The same information will be presented at both meetings. The public is encouraged to attend anytime between the hours of 5:30 p.m. and 7:30 p.m. at the most convenient meeting location. The purpose of this public scoping meeting is to present information about, and receive public feedback on, preliminary alternatives for highway improvements in the North Houston corridor, the process being used to evaluate these alternatives, and how community feedback has been incorporated to date in the planning process. The revised Need and Purpose Statement and Project Coordination Plan documents will be available for review. After the scoping meetings, the information presented at the meetings will be available for review and reproduction on the project website www.IH45NorthandMore.com, and at the TxDOT Houston District office, 7600 Washington Avenue, Houston, Texas 77007. The office is open Monday through Friday from 8:00 a.m. to 5:00 p.m., excluding state holidays. The public will have the opportunity to provide written comments during and after the meeting. If you are unable to attend one of the public scoping meetings, you may view project information and submit comments on the project website www.IH45NorthandMore.com, or you can mail comments to: Director of Project Development, Texas Department of Transportation, P.O. Box 1386, Houston, Texas 77251-1386. You may also email comments to the address: HOUpiowebmail@txdot.gov. Comments received by email or postmarked by Friday, October 26, 2012, will be included in the public meeting record. Here’s the direct link to the documents and comments from the first scoping meeting. Take a look through them and be sure to attend one of the meetings in October. Marty Hajovsky has more. 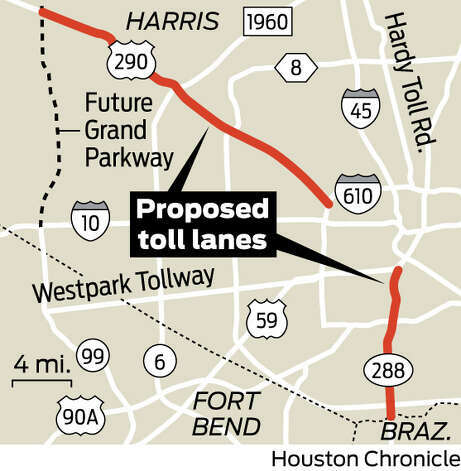 Projects to widen U.S. 290 and Texas 288 with a mix of free and toll lanes in an attempt to ease congestion in the traffic-choked corridors would get a jump-start under a proposed agreement between Harris County and the Texas Department of Transportation. The deal, scheduled for a vote by Commissioners Court [today], also foresees the state building a direct connection from Texas 288 to the Texas Medical Center, as well as improving nearby Almeda and Cullen. TxDOT spokesman Bob Kaufman said work on U.S. 290 could start early next year; he declined to say when dirt could turn on Texas 288, but said environmental work is under way. The proposal envisions a free lane being added in each direction on U.S. 290 between the 610 Loop and the Grand Parkway, and two to three managed lanes in the center. There is disagreement about which directions those lanes should flow at what times. The plan for Texas 288, according to the agreement, would see two toll lanes added from U.S. 59 to near the Brazoria County line. TxDOT’s Kaufman said it is too early to discuss details on either project. Alan Clark, head of transportation planning for the Houston-Galveston Area Council, said the agreement puts long hoped-for improvements “within striking distance.” Both stretches of U.S. 290 and Texas 288 are among TxDOT’s 100 most-congested road segments. Citizens Transportation Coalition board chairwoman Marci Perry and advocacy chairwoman Carol Caul said they support improvements to the congested section of U.S. 290 inside Highway 6, but said population statistics do not support such an investment much beyond that point. Precinct 4 Commissioner Jack Cagle, whose district is home to a large section of U.S. 290, said there is no question that both projects are needed. 1. I don’t think there’s any question that the return on investment for the 290 expansion is much greater for the 610 to SH6 section of the highway than it is for the rest of the way out. This is about justifying the ridiculous amount that TxDOT and the county will be spending on the Grand Parkway extension north from I-10. It’s also another example of how much we favor spending on transportation projects where there aren’t any people yet over those where there are. To some extent that makes sense – you do have to plan for growth – but to a much larger extent it’s about politics rather than need. The County Commissioners care a lot more about some parts of the county than they do about some other parts of it. And remember, “planning” inside an established population center hinders growth, while “planning” outside existing population centers facilitates it. 2. My experience on 288 is almost exclusively the stretch of 288 between 610 and 59. Whatever this plan may do to alleviate congestion on 288 outside 610, I can assure you it will exacerbate it inside 610. Take 288 north any afternoon, and I can guarantee that it will be backed up starting around MacGregor all the way up to 59. This is because that stretch of 59, which stretches back to at least Greenbriar, is hopelessly congested all the way through I-10. What do you think the effect of bringing in more people on 288 will be? As for having a direct connection from 288 to the Medical Center, all I can say is that “the Medical Center” is a huge place, with components along Old Spanish Trail, Holcombe, and Fannin. Where exactly would this “direct connection” go? What path would it take? How will you avoid massive congestion at its terminus? Perhaps those aren’t TxDOT or HCTRA’s concerns, but as someone who currently works near the Medical Center, they sure as heck are mine. I’m sure you will be completely unsurprised to hear that I-10 has bad traffic congestion. You may be surprised to hear where the worst of it is, however. Just in time for Thanksgiving travel, a new study has found that a stretch of Interstate 10 through Houston is one of the nation’s most congested highways. 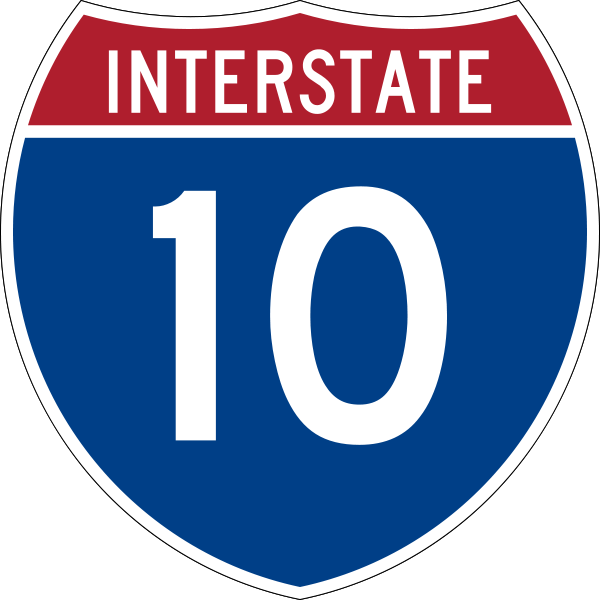 The study by The Weather Channel, the Texas Transportation Institute and INRIX, a provider of traffic information, found that eastbound I-10 between T.C. Jester and San Jacinto is the fourth-busiest road in the country. According to study highlights released today by the Weather Channel, this 4.4-mile stretch costs $43 million dollars a year in wasted gas and drivers’ time. In 2010, this section of I-10 cost drivers 475,000 wasted hours and 951,000 wasted gallons of fuel, according to a news release about the study. Yes, I-10 inside the Loop is the stretch cited by the study as our worst and one of the worst nationally. I don’t know how much this study factored the current construction into its calculations, but it’s certainly a factor. Even without that, it’s been getting worse, thanks in my opinion to the bottleneck at I-45. I’m willing to bet that after the service road expansion is completed we’ll still see frequent major backups. A summary of the study is here, and all of the reports are here. I have to say that I’m not exactly clear where that “fourth-busiest” ranking comes from. If you look at the Congested Corridors Report and scroll down to Table A-2, Congestion Leaders, this bit of I-10 is ranked #26 overall. 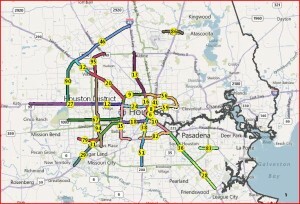 The Houston roadway ranked highest on Table A-1, Reliably Unreliable, is Loop 610 from 290 to Yale. 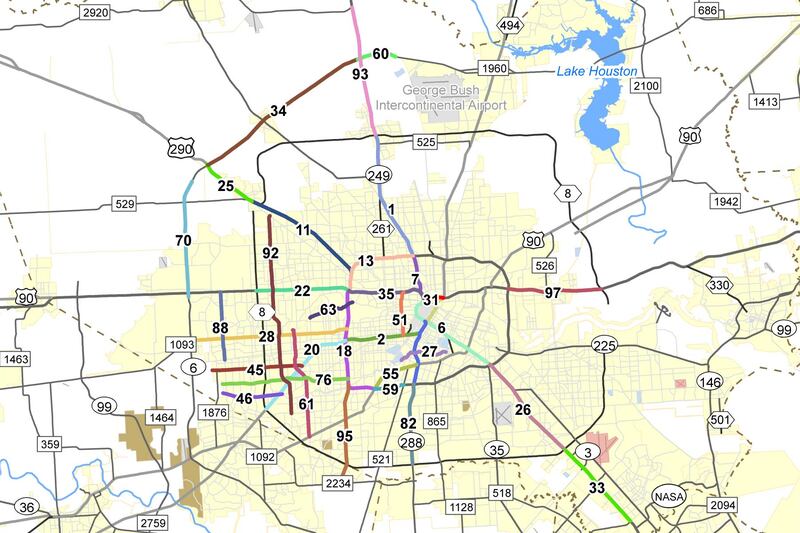 All the data for Houston corridors is here. If you can see how any one overall ranking was determined, you’re seeing more than I am. The Houston Business Journal, which discusses a couple of other Houston corridors and which appears to have a more accurate depiction of their rankings in this study, has more. Despite neighborhood opposition, City Council has approved a 380 agreement for the proposed Kroger on Studemont at I-10. District H Councilman Ed Gonzalez, who represents the area around the proposed store and who championed the 380 agreement, insisted the deal was less an incentive to Kroger than it was a way for the city to extract benefits from a market-driven project. The deal gives the city two blocks of road, sidewalks and traffic lights more than a decade early, and also hands over to the city a third of an acre that it would someday need to extend Summer Street from Studemont to Sawyer. Mayor Annise Parker said Houston’s strategy differs from that of cities that build infrastructure first and then try to recruit businesses to move in. “We have not chosen to use that sort of what I would call ‘corporate welfare.’ We have said, ‘Business, if you want to open and you need the street, you pay for the street. We’ll pay you back, but if you really want to be there, you use your dollars upfront,'” Parker said. The city will pay a premium on that upfront money. The deal calls for the city to pay Kroger back with 5.17 percent interest. The city’s rate on bonds through which it finances public works projects ranges from 2.55 percent to 4.06 percent, according to information that Councilwoman Anne Clutterbuck got from the city’s Finance Department. The rationale given by Mayor Parker for the use of 380 agreements is sensible. It’s certainly a less risky approach than “build it and hope they come”. Aside from the premium interest rate, whether it’s good policy to use a 380 in this particular location is another matter. The outline of the deal here sounds better than what was struck for Ainbinder on Yale Street, but I’m dubious about the wisdom of a supermarket there. I’ve seen traffic at the light back up all the way to Center Street during the afternoon rush hour, thanks in large part to the many people wanting to enter I-10 West from Studemont. The thought of adding in grocery store traffic, not to mention another traffic light, makes my head hurt. Having said that, I’m not sure what kind of development could have been built there that would be both low impact on traffic and profitable to the developer. Long term, I may have to think about using Sawyer/Watson as an alternate route, though if the rumored plans of an Alamo Drafthouse come to fruition, it may not be much better. Surprise, surprise. The No. 1 road for traffic congestion in the entire state is — drumroll, please — the stretch of Interstate 45 between the North Loop and Beltway 8. In fact, Harris County was home to six of the top 10 most congested roads in Texas. A list of the top 100 was released Tuesday by the Texas Department of Transportation. A third were in Harris County. You can see the Harris County listing, which is basically “I-45 anywhere inside Beltway 8, plus two other stretches of road”, here. The state list is here, along with links to TxDOT’s plans to do something about them. I’m curious as to the methodology for ranking the pieces of road. The second-ranked bit of highway in town, third overall in the state, is I-45 North between I-10 and 610, yet its “Annual Hours of Delay” is by far the lowest among those listed. I-45 between I-10 and the South Loop has the second highest hours of delay figure, but comes in behind it. There must be some other factors here, but I cannot tell what they are. In any event, I will note that this particular stretch encompasses the Pierce Elevated, which as you know is a problem I think we’ll always have. At least, if there’s a plan to do something about it, I’m not aware of it. Brown’s traffic plan is here, and my commentary on it is here. Peter Brown will use the latest technologies to allow residents to instantly alert the City of poorly maintained infrastructure – including potholes and signage problems – to help make roadwork more responsive. Smart-phone applications can enable streamlined reporting to city departments, allowing residents to quickly collect and share photographic evidence of disrepair or neglect. We can also connect with residents via their existing social networks to enhance communication between residents and the City. Note that the city of Boston has already implemented an iPhone app that will allow residents to snap photos of neighborhood nuisances, such as potholes, graffiti, and blown street lights, and e-mail them to City Hall to be fixed. If they can do it, we can do it. – That said, there are numerous items here that clearly bear the “Peter Brown” stamp, and not just because almost all of them contain the phrase “Peter Brown will”. Mostly these can be summed up as urban planning in some form. That’s Brown’s passion and I daresay his motivation for running, and it’s clear he’s put a lot of thought into these items. It’s also clear that not everyone will agree with some of them, and to a large extent Brown’s chances of winning this race will hinge on how successful he is at getting people to agree with his vision. I personally find a lot to like in his vision, but I also have serious doubts about how much of it could ever actually get implemented. – A key component to Brown’s vision is the idea that you can help to decongest the streets by making it possible for people to do less driving in their daily lives. We should encourage denser mixed-use growth and development near public transit to help reduce car trips and save time. With shops, amenities, and employers all located close to housing, growing livable, mixed-use centers will help minimize the amount of time residents spend on the road. Similarly, encouraging growth near public transportation will give residents more transportation choices. Oftentimes, workers are forced to take long commutes because they can’t afford to live near work. Peter Brown will coordinate our housing policy with our transportation plan and enable workers to live closer to their places of employment. We need to ensure a variety of housing choices so that new development is accessible to the entire community. With nearly a hundred square miles of undeveloped land in Houston, we have a tremendous opportunity to shape our future that few other large cities have. Peter Brown will encourage smart, high-quality development of urban density that improves the quality of life and strengthens neighborhoods. A denser Houston would put workers closer to their jobs, allowing them more choices about the routes they take, including better access to the city’s street grid as an alternative to commutes along primary arterials and highways. Aside from the transportation benefits, it will also reduce response times for emergency services and first responders by keeping population centers closer to public safety facilities. This is classic Brown. He’s talked about this sort of thing for a long time, and again, I think the reason he’s running for Mayor and not another term in Council is because he believes being Mayor is the only way he can really do this stuff. I think there’s a lot to be said for Brown’s ideas, which include making Houston more bicycle and pedestrian-friendly and expanding transit options. 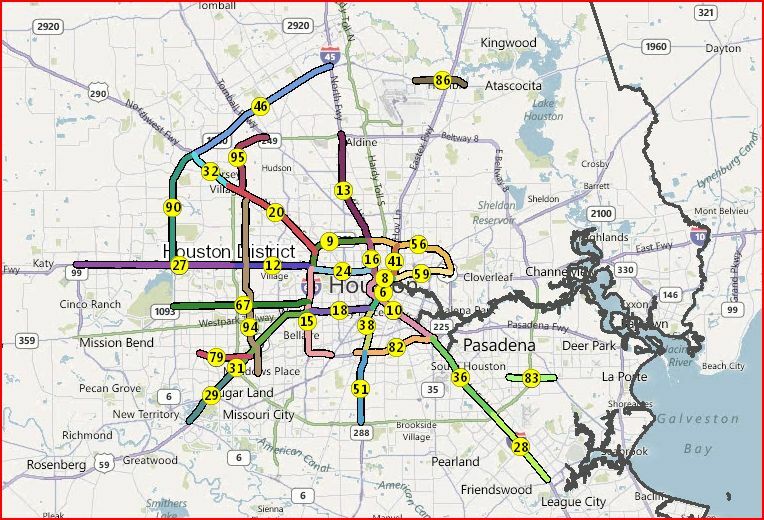 There’s really no reason why Houston can’t have a more walkable, transit-oriented urban core. I realize we’re in a time of the year when the notion of walking anywhere isn’t too appealing to most folks, though as Andrew Burleson has shown, the quality of the pedestrian experience can make a huge difference in that. Most of the year here is just fine for being outside, and as someone who actually has gone to school in two feet of snow, I’d say that on the average our climate is more conducive to that kind of lifestyle than many cities where it is the norm. Obviously, not everyone wants to live in an urban area, and even if Peter Brown were to achieve everything on his wish list, there’d still be plenty of people living in the burbs. The point is that more people would choose to live in this kind of setting if it were more readily available and affordable, and that there are a lot of things a Mayor can do to make that happen. The irony is that a lot of these things are deregulatory in nature, such as loosening requirements for providing parking, which tends to get lost in the “free market” dogma that arises whenever stuff like revisions to the form-based codes are brought up. The main critique I have of Brown’s vision is that we’ve already got a lot of density happening in the core, mostly but not exclusively inside the Loop, and it’s already had a significant effect on traffic and mobility in the area. A lot of main roads, at least ones I drive on like Kirby, Shepherd, Richmond, and Westheimer, are already at the point of being nearly unusable, and this has a spillover effect onto residential streets. It’s not clear to me that Brown has prioritized mitigating the effects of some of this unplanned density. Infill development, especially in places that are already reasonably serviceable by transit, makes a lot of sense, but I don’t think we can really tackle this problem without dealing with the places that are plenty dense now. Part of the reason why I have my doubts about Brown’s ability to get his vision implemented is that the problems we’re seeing now, and will see more of as we continue to densify (whether in a planned fashion or not) are caused by our unwillingness to require developers to pay for the costs they impose on our infrastructure. We’ve crammed a bunch of townhomes into old neighborhoods, but we haven’t addressed the strain this has put on sewers and drainage in most of them. A lot of inner core streets are in disrepair, and the sidewalks, where they exist, are often in even worse shape. How do we deal with this, and how do we pay for it? It makes sense to me to pass at least some of these costs to the developers, but good luck with getting them to accept that. I find this to be a real stumbling block to buying into the vision he advocates. It’s also the case that some forms of mitigation are necessarily long-term in nature. For instance, Metro could announce tomorrow that it’s designating a Kirby Drive Corridor for its next phase of light rail expansion, and I’d have no faith that they’d even break ground before Mayor Peter Brown finished his third and final term in office. How do you ensure your vision outlasts you? Is that even possible for something like this? – Moving on, Brown is also talking about encouraging telecommuting, which also has the effect of decluttering the roads, as well as saving gas and reducing our carbon footprint. Employers who help reduce traffic during peak periods and keep us moving should be rewarded for the time and money they are saving all of us. Peter Brown will find ways to provide incentives for companies that offer flexible schedules and stagger shift times to avoid rush hour commutes, based on the amount of traffic that they are able to off-set. Brown says the city will lead by example on this, and that’s fine and good. As Houston Politics notes that this approach has been tried, which makes me wonder what Brown can or would do differently. As with Parker’s crimefighting plan, this is more about the what than the how, so that remains to be seen. There’s more to Brown’s plan, but I think this post is long enough. Since he includes a bit on what Houston’s busiest streets will be in the year 2035, I’ll point you to this David Crossley post which takes a look at some of the other projections for the farthest-out forecast we have of the Houston region. Check it out. Traffic congestion hasn’t gotten any better. Rising gasoline prices in the last half of 2007 produced less traffic, according to an annual study by researchers at Texas A&M University’s Texas Transportation Institute. The typical urban commuter spent one less hour stuck in traffic that year, and wasted one less gallon of gasoline than the year before. Although the study analyzed data only through 2007, the researchers said they were fairly confident that the trend continued in 2008, as the recession kept people and products off the roads. “Not as many people are driving, they are sitting at home because they don’t have a job to go to,” said Tim Lomax, a research engineer who co-authored the study of 439 urban areas. The national average time lost to traffic in 2007 was 36.1 hours, down from 36.6 a year earlier. But the Houston region did not see a dip in congestion because the recession has not hit as hard here, Lomax said. Rush-hour delays in Houston stayed flat from the previous year. In 2007, drivers here wasted an average of 56 hours in stopped or slowed traffic, and burned 40 gallons of fuel while doing it. That means Houston, the nation’s fourth-most populous city, also ranked fourth in time lost to traffic. Los Angeles, at 70 hours, ranked highest. Houston has been steadily climbing in the ranks for years. “The places like Houston where the ranking got worse, those are the places that had pretty good economies,” Lomax said. Urban areas like Oklahoma City, Raleigh-Durham, and Charleston, S.C. also experienced the blessings of economic growth and the related burden of more traffic, Lomax said. All in all, that’s a tradeoff most of us would take. But maybe one of these days we’d like to keep our traffic from getting worse as our economy grows. Then what? The study concludes that congestion can only be eased through a mix of solutions, such as adding lane capacity, increasing public transit, offering workers flexible hours and telecommuting, using technology to better manage accidents and traffic flow, and promoting “denser” land use so people don’t have to drive as far to work and shop. In other words, expect the trend to continue for the foreseeable future. Eye on Williamson has more. I’ve seen this linked several places, and finally got around to reading Phillip Longman’s article on freight rail and the very strong case for investing in it as part of an economic stimulus package. It’s got something for everyone, including the promise of relieving highway congestion by getting big trucks off the interstates. Read it and see what you think.